A hearty keto beef stroganoff recipe that will delight your taste buds! This creamy concoction is sure to be a winner for everyone at your family dinners! Beef stroganoff is a Russian dish, which consists of sautéed pieces of beef served in a sauce overtop a bed of rice or noodles. Origins of the dish date back to the mid-nineteenth century. The name of the dish is often attributed to the Stroganov family of Russia, but could also be from the Russian word “strogat,” which means to chip or shave. This, of course, refers to the original way the meat was prepared. A book entitled “A Gift to Young Housewives” contains the first known recipe for beef stroganoff and was published in 1871. The recipe calls for lightly floured beef cubes to be satueed, sauced and served. Today, the recipe is famous around the world and lots of ingredient variations can be found. 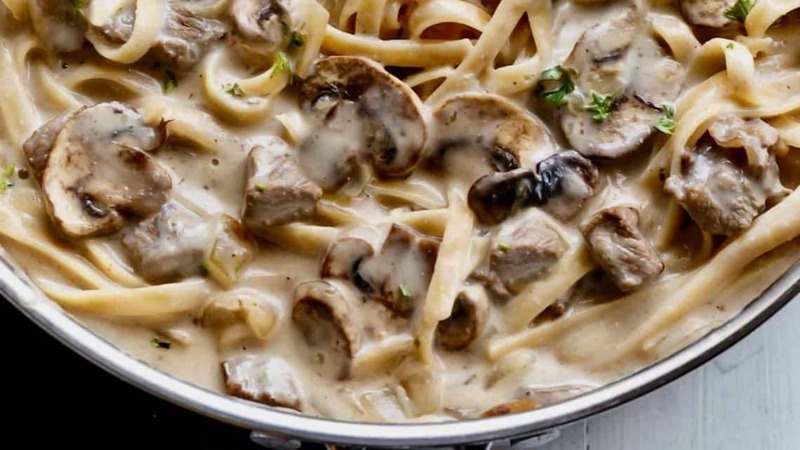 This keto beef stroganoff recipe is creamy, delicious, and wonderfully low in carbohydrates. We also use ground beef, which is a bit easier to deal with than sliced or cubed beef steak. In order to make this delicious recipe, you’ll need to make sure you have the following ingredients on hand. After you have all of these ingredients, you’re ready to start cooking! There are several ways to thicken the sauce for this recipe. Even though you’re using heavy cream, you’ll still want to thicken the sauce some so it’s not too runny. The easiest way to thicken liquids is to add a small amount of xanthan gum. 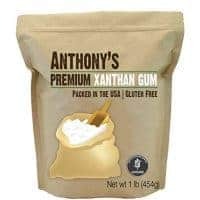 In case you’ve never used it before, please keep in mind a tiny amount of xanthan gum can go a long way. Using too much can thicken something too much and ruin the recipe. Use the amount recommended in the recipe below, stirring constantly over heat until the cream begins to thicken. Another simple, yet more time-consuming way is to reduce the sauce by cooking it longer. Continuing to heat the sauce will reduce the water content, therefore making the sauce thicker. While this does take more time, it removes the added ingredient of xanthan gum. Normal beef stroganoff is not gluten-free. This recipe, however, thanks to its substitutions and lack of gluten-filled ingredients, is gluten-free. Even if served over rice, most stroganoff recipes still call for flour to be used to thicken the sauce. Since the beef stroganoff recipes we are used to (generally) are always served overtop a bed of egg noodles, we might as well make it as “authentic” as possible. Using a keto-friendly noodle is a great way to make this dish even more satisfying and delicious. This recipe calls for shirataki fettuccine noodles, but other types of noodles can be substituted in its place. Here are some ideas and information about different noodles you can use with this scampi if spaghetti squash isn’t for you. We recommend using shirataki noodles. If you aren’t familiar with them, these noodles are made from the root of konjac yam. The word shirataki itself means white waterfall, which is a very accurate description of the appearance of the noodles. In the United States, these noodles are normally found packaged in water. They are great for those on keto/low-carb diets because they are made up of water and glucomannan, which is a soluble fiber. They are very, very low in digestible carbohydrates. As a note of caution, be wary of shirataki noodles that contain all kinds of added ingredients. Some of the newer brands contain several non-keto ingredients as fillers instead of just the main shirataki ingredients. If you prefer to not use shirataki noodles, using zucchini noodles (also known as zoodles) is the next best option. These noodles can easily be made using a spiralizer with a zucchini. There are, however, some other harder methods to make zoodles. One piece of advice is to salt the zoodles lightly. Let sit for about three minutes, then pat dry. Depending on how much water content the zucchini has, this can help draw out some of the moisture and make the noodles hold up better, especially when cooked. You can find lots of information over at Living Well Mom on some different methods of making zoodles. While some can deliver on some of their promises, most use sketchy science to lower their carbohydrate content. As a general rule, you should steer clear of these types of products as they are full of false promises. If nothing else, they are also full of questionable fillers and other ingredients. Having said that, if there is a brand of this pasta that you use and it works for you on your keto/low-carb journey, then, by all means, use it. We are all different and our bodies can tolerate different things and still lose weight. However, if you have never tried these kinds of pasta before, it is best to not start. There are lots of delicious side dishes and sweets recipes that will help to make this dish round out a complete meal. Meat Chopper – A meat chopper can be a huge help when working with any type of ground meat. It can make quick work of separating and chopping meats into smaller pieces, which is normally the goal when cooking with ground meat. In this case, using a chopper will help to cook the meat more evenly and faster, since you are able to break it into smaller pieces as it is cooking. 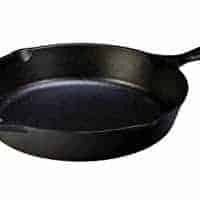 Cast Iron Skillet – Cast iron is sturdy, heavy-bottomed, and basically indestructible. Why does that matter for you? Well, that means it makes a GREAT material to make cookware out of. A nice, heavy duty skillet is an essential tool in your kitchen. Cast iron skillets also provide a good amount of depth, which is nice when making sauces. If you don’t have a cast iron skillet, you definitely need to look into getting one! Remove from heat and serve over shirataki fettuccine noodles!